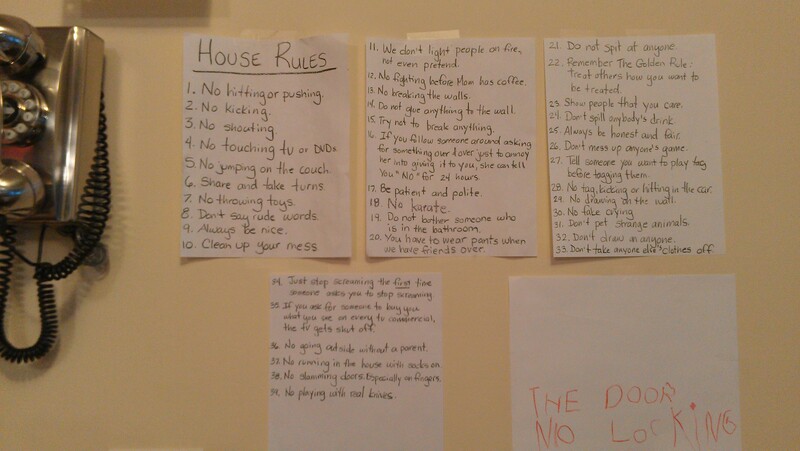 To my befuddlement, lots of people come here looking for House Rules ideas in order to keep their kids in line. 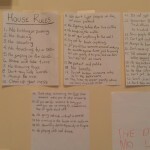 Early last year, I shared the House Rules for kids we keep hung in our kitchen. Let’s just say that since then? The list has grown – ahem – a bit. The response to a photo I shared earlier today of House Rules #34-39 included quite a few people asking to see what was hidden between #18 & 34. Ask? And ye shall receive. 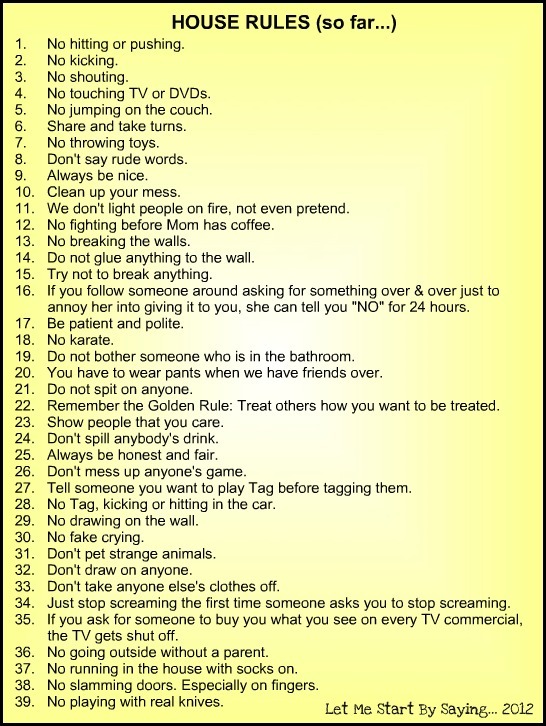 Yes, there is a story behind each of these rules. Some I came up with, others the kids did, and the rest were a team effort. Which is why this list most likely makes our home one of your Top Ten Homes You’d Least Likely Visit Without Wearing SWAT Team Gear. An unedited photo I just took of the crayon-scribbled list hanging in my kitchen, as I sit here at the kitchen table next to my kid who is getting a little too close to the wall with her markers. Or you could just ask one of my friends, who like to check to see what’s been added to the list since their last visit. Because something’s always being added. Read, enjoy, ask anything you want. You know you’re curious. So. What’s your favorite rule from the list? 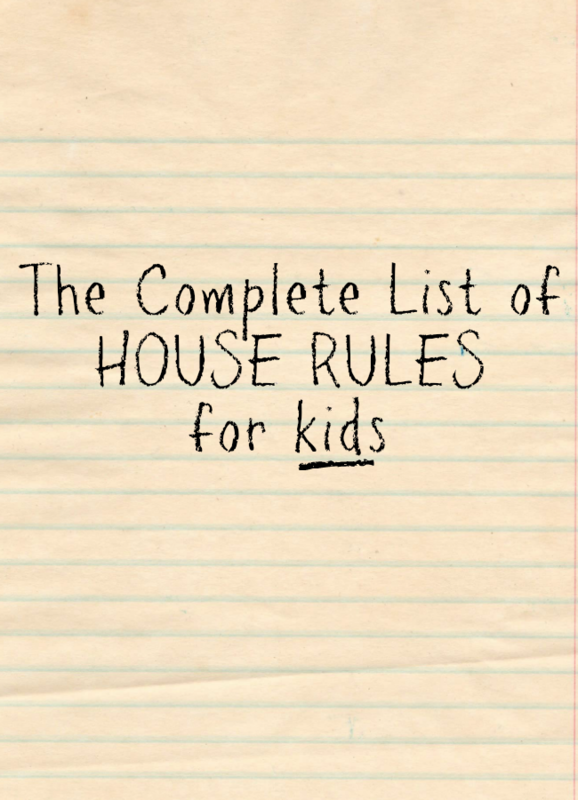 Do you have any House Rules we should consider adding? I know this is a really late comment to an old post, but how do you enforce these? What are their consequences or your follow-up? Genuinely curious! !